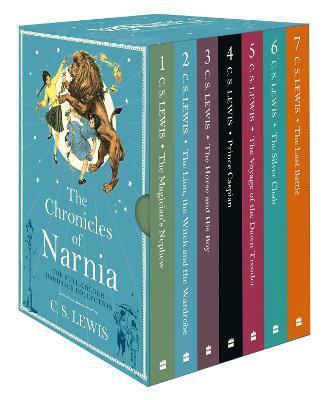 Enjoy the full majesty of the Chronicles of Narnia with this slipcased set featuring all seven novels. "Forget Simba. There's a new lion in the Magic Kingdom... Long before J.K. Rowling dreamed up Harry Potter, Lewis was busy with his seven book series." "Like the `Rings' cycle... the seven Narnia books have a long and loyal following." "Narnia offers huge scope for a profitable film franchise... fantasy is currently the toast of Hollywood." "...a big, live action movie franchise to help spark new merchandising lines and theme-park attractions."